The trick in framing a vaulted ceiling is figuring out what to do with the ceiling joists. These horizontal framing members tie a building's outer walls together and resist the outward force exerted by the roof rafters in conventional framing. Without joists, the walls can bow outward and the roof ridge line may sag. Vaulted ceiling framing solutions must open up the space under the rafters while still providing adequate support for the roof's weight load. Vaulted ceiling framing must be able to resist the downward and outward thrust of the roof's weight load. Collar ties are horizontal framing members that are essentially ceiling joists that have been moved upward to span the distance between the rafters higher than the top of the walls. They still tie the rafters together, but they no longer form the low, flat barrier that ceiling joists do. There is a limit to how high collar ties can be installed, however; ties that are moved more than one third the distance from the top of the wall will greatly increase the risk that the unsupported bottom portion of the rafters will flex and the walls will bow outward. Collar ties may be left exposed, allowing the ceiling to be open to the underside of the rafters. If the collar tie option leaves too many framing members in the ceiling vault for your taste, you can probably get away with removing some of the collar ties or ceiling joists to achieve a more open vault. In general, leaving every third joist or collar tie intact will provide adequate support for the roof load, and the ties in between can be removed. Doubling the remaining ties by installing one on each side of the rafter provides some extra strength and is more aesthetically balanced. To do away with collar ties or joists entirely, you'll have to provide some other structural support for the weight of the roof. An alternative framing method involves using a heavy ridge beam that rests on vertical posts at the ends of the building. These structural members need to be strong enough to support half of the roof's weight, thereby reducing the weight load resting on the top of the walls. The reduced load will be less likely to push the walls outward, and the interior ceiling vault can be free of horizontal supports. Engineered roof trusses may be designed to create a vaulted ceiling while still providing sufficient support for the roof's weight. 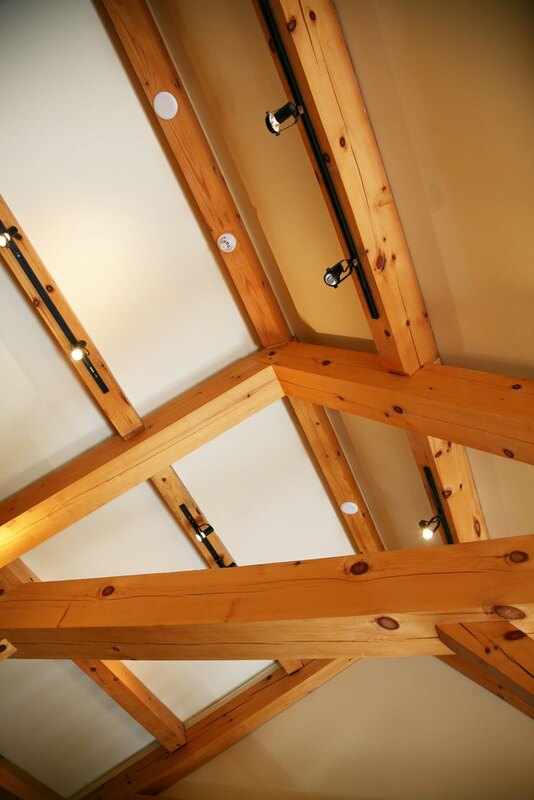 In a common truss design, sloping top chords function just like rafters in conventional framing, and horizontal bottom chords fill the role of ceiling joists. A typical vaulted ceiling truss, called a scissor truss, has bottom chords that slope upward at a slightly shallower angle than its top chords. The sloping bottom chords form a vault that is not quite as high as the outer slope of the roof but is uncluttered by horizontal supports.